The staff at The Aware Show takes tremendous pride when shipping products to you. Every order is handled with extreme care so that it arrives in perfect condition. We urge all customers to inspect their package for damage or tampering before receiving or signing for receipt. We will be glad to refund or replace damaged items within 30 days of shipment. If there is a problem with your order please contact us right away at at support@theawareshow.com. All packages shipped USPS are designated with a “shippers release” so that a signature is not required for delivery. However, it is up to the discretion of the delivery person whether to leave the package or not. Thus, we highly recommend that someone be available to accept the shipment, particularly if the shipping location is an apartment complex or office building. We cannot be held responsible for packages left at an address when someone is out-of-town. Please make sure the recipient will be home before submitting an order. The packages shipped are generally products offered by the guest’s on The Aware Show or one of the Teleseminar Series produced by The Aware Show, not by The Aware Show directly. The Aware Show is not a retail store carrying the Guest’s Special Offers in inventory. We do provide re-shipping for many of Guest’s appearing on The Aware Show or Teleseminars produced by The Aware Show. The Guest speaker’s bulk ship their Special Offer products to us, by truck, generally within 10-14 days after the live event. Every reasonable effort is made to ship your order within 4-6 weeks of receiving full payment for your order. If you have not received your shipment, please contact us right away at at support@theawareshow.com and ask us to look into it. Please understand that the items you have ordered are products offered by the guest’s on The Aware Life Teleseminar Series event, not by The Aware Show or The Aware Life directly. Neither The Aware Show nor The Aware Life Teleseminar Productions are retail outlets with inventory, however we do provide re-shipping for many guests, who provide the individual items from various sources. These special offers are bundles of individual items that are unique to each Guest Speaker’s Special Offer. The items in the Special Offer Bundled Packages may come from multiple sources and have to be assembled, packaged, then shipped after the live event. Often, the guest lecturer will also decide to add to the bundled package during the event, which further delays the ship date. ** Please understand that these Special Offer Bundles contain individual items that may come from multiple sources. They are assembled, packaged and shipped to you, after the live event, as often the Guest will add to the Special Offer during the event, further delaying the shipment. Every reasonable effort will be made to ship your order within 4-6 weeks. Domestic addresses should typically receive their packages within 5-7 days after that. International shipments may take longer and the recipient’s country may asses a customs duty/tax, which is the responsibility of the recipient. Occasionally a “Special Offer” may require additional time to produce, before we are able to ship. An example of this would be the “Gems” packages. The “Diamond” version of this package includes a set of all the Guest Seminar’s on disc. But the disc’s cannot be produced until after the last semianr in the series. See the “https://theawareshow.com/gems” link for full delivery details of this package. Be sure to check the “Shipping Notice” on the bottom any any/all Special Offer or other sales pages for specific shipping details for any “Special or other Offers from The Aware Show. If for any reason, we find that we cannot meet the commitment to ship your order within 4 to 6 weeks, we will notify you in writing, with a new, projected, ship date. At this time, you may elect to cancel your order and receive a full refund immediately. We ship to the United States and most foreign countries by USPS to guarantee a quick and secure delivery. If you are unsure of shipments to your country, or if your order is urgent,please contact us right away at at support@theawareshow.com before making your purchase. We cannot guarantee any shipment for a date specific delivery. International shipments may be assessed a customs duty charge. All such charges are the sole responsibility of the buyer. If you are unsure of your country’s importation laws and duty charges, please seek advice from your country’s customs and immigration service. Sometimes things happen, and we hope to make your experience positive. Should we cause a problem with your order, we will make it right. We will do everything we can, including bending over backwards and begging for forgiveness for problems caused by us. We are all human and make mistakes. If you made a mistake and provided an incomplete or incorrect address during your order process, please contact us right away at at support@theawareshow.com and provide your purchase information and the corrected information. We are not responsible/liable for loss of goods or delays caused by natural disasters like earthquake, flood, hurricanes, or any other force majeure events. Due to the many different languages and time zones involved, The Aware Show Support provides technical support for customers world wide via the support@theawareshow.com email address or by support requests entered directly at https://theawareshow.com/support. To protect your personal and financial information, all communications regarding your account will be limited to the email account of record, to confirm you as the legitimate account holder. Any and all communications regarding your account with us must be made using the email address of record, the one used to make the purchase, in order to authenticate you as the legitimate owner of the account. Please understand that this is the only way we have to authenticate you as the valid account owner. This is to protect you as your account contains both personal and financial information. Additionally any change requests to the account or any order or shipping details must also come from the email address of record. All Refunds & Returns require that a support request ticket be opened, packages returned without the proper processing may not be accepted. 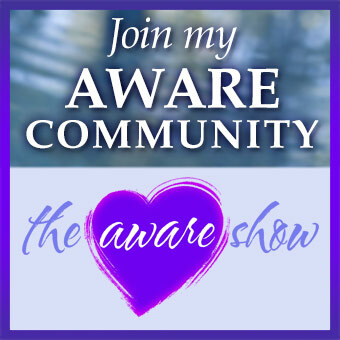 Open a support request ticket at support OR send an email request to support@theawareshow.com . Confirm that you have RETURN/REFUND REQUEST in the subject line. Be sure that you include your FIRST and LAST name and submit the refund request using the EMAIL ADDRESS used to make the purchase. If your order included a physical package we will issue you an RMA (Return Materials Authorization) number and send you the return shipping address. The RMA number is used to assure each shipment is properly credited to the right account, quickly releasing your refund payment.NOTE: That RMA number must be visible on the outside, of the returned package, or we may not accept delivery. Once the product arrives, simply write the RMA# below the return address that we supply, and return the package to us via the same shipper. NOTE: Cancellations, returns, refunds and exchanges may not be accepted on all product packages or events. Please review the specific details for each product, package or event to determine what will be accepted and what the terms are. Cancellations, returns, refunds or exchanges are never honored for Live Events after the event starts or after the first event starts in the case of a multiple event package. You can return unused goods you have ordered from us for any reason, at any time within 30 calendar days of the date of shipping, for a full refund of the purchase price, excluding shipping charges. Prior to shipment, if you wish to cancel your order, email us at support@theawareshow.com using the email address of record ( the one used to make the purchase) so that we can authenticate the request as valid. Please note that an email order cancellation does not guarantee a ship cancellation. After your product is shipped, you must request an RMA# (see to return an item, below) and the product must be returned in good condition, within 30 days of receiving the RMA#, to receive a full refund. The costs of returning goods to us is your responsibility. Upon receipt of the unused goods, we will give you a full refund of the purchase price and the outbound shipping. In the case that you receive a product that is defective, damaged or incorrect, we will provide you with a replacement product or a full refund of the purchase price for unused items, minus the shipping, upon the return of the product to us. All Returns and Exchanges require that a support request ticket be opened, and an RMA (Return Materials Authorization). Packages returned without the proper processing may not be accepted. Open a support request ticket at support at https://theawareshow.com/support OR send an email to support@theawareshow.com. Confirm that you have RETURN/REFUND REQUEST in the subject line. Be sure that you include your eMail Address and your full name and submit the refund request using the same email address you used when you made the purchase. If your order included a physical package that was shipped to you, we will issue you an RMA (Return Materials Authorization) number and send you the return shipping address. The RMA number is used to assure each shipment is properly credited to the correct account, quickly releasing your refund payment. Once the product arrives, simply write the RMA# below the return address that we supply, and return the package to us via the same shipper. That RMA number must be visible on the outside, of the returned package, or we may not accept delivery. If you have any questions, simply ask them when you open the support ticket at http://theawarewhow.com/support or in the email to support@theawareshow.com and we will be happy to assist you in the Refund or Return process. You are responsible for the package until it arrives, in good condition, at our door. We highly recommend that you insure and track the package, to protect yourself. If you have any questions, simply ask them when you open the support ticket at http://theawarewhow.com/support or in an email to support@theawareshow.com and we will be happy to assist you in the Refund or Return process. All refused shipments and unauthorized returns will be charged an amount equal to the full initial delivery (outbound) shipping plus an amount equal to the return (inbound) shipping, plus a minimum unauthorized return processing charge of $25.00, the total sum of which will be deducted from any refunds due.. If you will not be home to receive your order, we can ship your order to your place of work, or another more convenient destination. As a security precaution to protect our customers against fraud, when you order merchandise to be delivered to a destination other than your billing address, we may confirm that your credit card or financing company has this alternate shipping address on file. To help expedite your order, simply call your issuing bank and provide them with your alternate shipping address. This may delay your shipment for a brief time. The cost for shipping is $20.95 for each item in the order. Your order will ship via USPS from our facilities in Beaverton, Oregon. Please allow up to 8-10 weeks for international delivery. It is important to note that you will have to pay custom duties and taxes on the items you purchase and that these local fees are not included in your invoice. All refused shipments will be charged the full return (inbound) shipping and this amount will be deducted from any refunds due. We will send you a shipping confirmation email when all or part of your order is shipped. This email is sent after the first USPS scan. The email will include the USPS tracking number. You will be sent a shipping confirmation email with a tracking number for every shipment.